Health enthusiasts need more than vibrant interiors and high-quality amenities to get them attracted to your gym which is why it is important to consider several factors when starting a commercial gym. First-time gym owners may often overlook the need to spend a lot of time when choosing the right multi gym machine. In this guide, we look at everything you need to know about multi gym machines as well as how to choose commercialmulti stationgym equipment step by step. What Is Multi Gym Machine? Multi gym machines help your gym members make the most of their exercise time while also helping you to maximize your floor space. Some smart designs allow users to take on multiple workouts in a relatively small space while adjusting settings quickly for better results. Multi station units are ideal for facilities with limited space. Commercialmulti stationgyms can feature multiple workout stations that are designed to hit every part of the body while allowing for multiple users to get their workouts done at one time. They are easy to use for beginners and are designed to withstand the load for advanced users. Single station gyms originated in health clubs in the mid 20th century but manufacture has since constructed compact multi gym machines borrowing from Walter Marcyan’s automatic barbell invention in the ’60s and ’70s that allowed users to perform multiple exercises with just one simple change of a pin. Most multi station gym machines function from a solitary weight stack that can be quickly adjusted by simply changing the pin selector level. 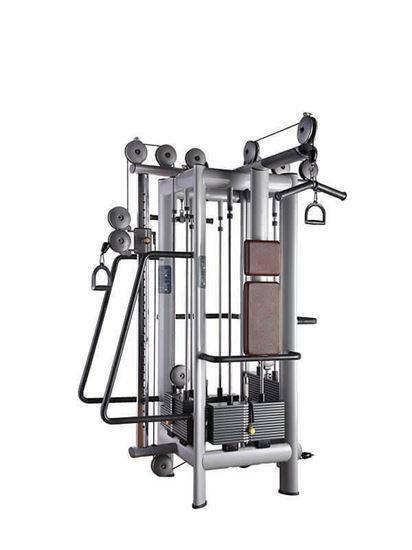 Once the user initiates a push or pulls motion from one of the workout stations, a series of cables and pulleys will lift the selected weight from the weight stack thus generating resistance. 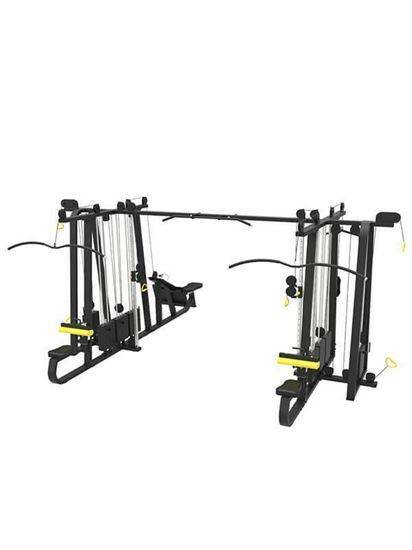 Multi gym machine price varies depending on the brand and range of exercise options available. The weight stack should be plenty enough to allow users to progressively increase their strength. An ideal multi gym machine will follow a set of workout stations that include chest press, lat pulldown, lateral raises, tricep pushdowns, bicep curl, Ab crunches, and leg extensions. Adjustability is also an important consideration to make in order to prevent injury and poor workouts. Try and find a multi gym machine that has a seat height adjustment as opposed to one with a fixed seat. Pulleys and cables play a critical role in the overall operation of a multi station gym equipment as poor cables may add a lot of extra resistance which will make the selected weight feel unusually heavier. Poor quality pulleys and cables may also cause a grinding motion that makes it uncomfortable to use the equipment. It is advisable to avoid cheap machines that use poor cables and pulleys. Instead, go for the affordable models that use bearings or tensile aircraft cables. Whether you are buying a treadmill or a commercial multi station gym equipment, it is important to keep in mind that choosing the right gym equipment and using them correctly is key to any successful workout. Here is a step by step guide to choosing commercial multi gym equipment. Before buying a multi gym machine, the first thing you may want to consider is the space available. Like Functional Trainer need more space. This involves assessing the exact space that will be occupied by the equipment in the gym. Stuffing too many gym equipments in a small area will have a significant effect on the look and feel of your gym besides making it difficult for everyone to exercise freely and get the most of a gym session. Each an every gym member has a different health goal which requires more than just providing the basic gym equipment. Do your research online to help you plan what you need to buy. Find out the latest and most effective types of multi gym machines available for a commercial gym. User reviews can also help you identify the best and most affordable commercial gym equipment brands. However, avoid over-relying on customer reviews when buying a product. A first-hand feel of the equipment you intend to buy is always better than blindly trusting reviews. It is important to consider the following factors when using the equipment. - The height should be adjustable with lever lengths etc. It is also important to consider the budget for your fitness equipment as most gym owners overlook this while trying to improve the look of their gym. Allocate a budget by comparing the different prices of equipment available on the market to get a deal that best suits your needs and budget. You can find this online or by visiting a trade show where you can get an idea of the different types of products and the quoted price. While it is good to consider the affordability of the commercial gym equipment, avoid poor and substandard quality when buying your multi gym machine. Safety is a key consideration when buying your commercial multi gym equipment as you want to avoid any risks of injury. 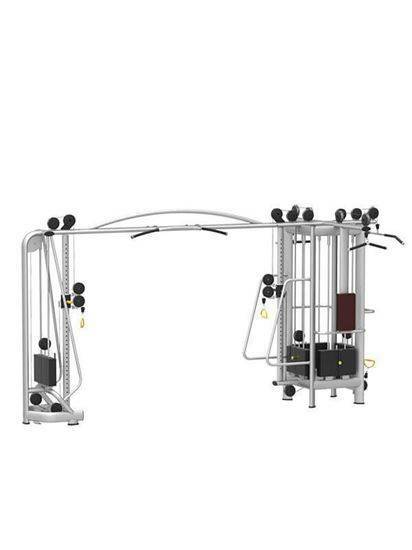 The multi gym machine that you choose must meet the standard safety requirements. You should also consider the maintenance aspect of the equipment by checking the brand's warranty, maintenance, and installation clause. Some top commercial multi station exercise equipment brands include Matrix Fitness, Lifefitness, Precor and Technogym. 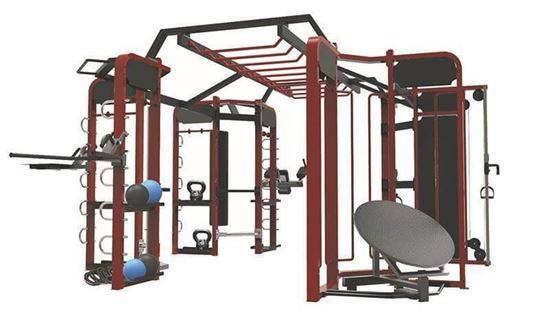 However, these brands are too expensive hence the need to go for more cost-effective models from Ntai Fitness a leading brand and multi station gym equipment manufacturer in China. Our models are highly efficient, long lasting and fabricated from top-quality materials. Where Is The Best FITNESS EQUIPMENT MANUFACTURER? If you Need a New Gym Specialist for Your New Gym. We can help you Step By Step Guide To Choosing Commercial Multi Station Gym Machine. Call us today and let us help you get more revenue and bigger profits for your Gym.